Bullfighter Justin Josey swings a lasso in front of the arena at Stampede Park in Cody, Wyoming on Thursday, Aug. 31, 2017. Josey, an Oklahoma native, has worked summers at the rodeo for the past four years. "There's no other place that you can get in front of bulls or rope a calf 90 nights a summer," said Josey. 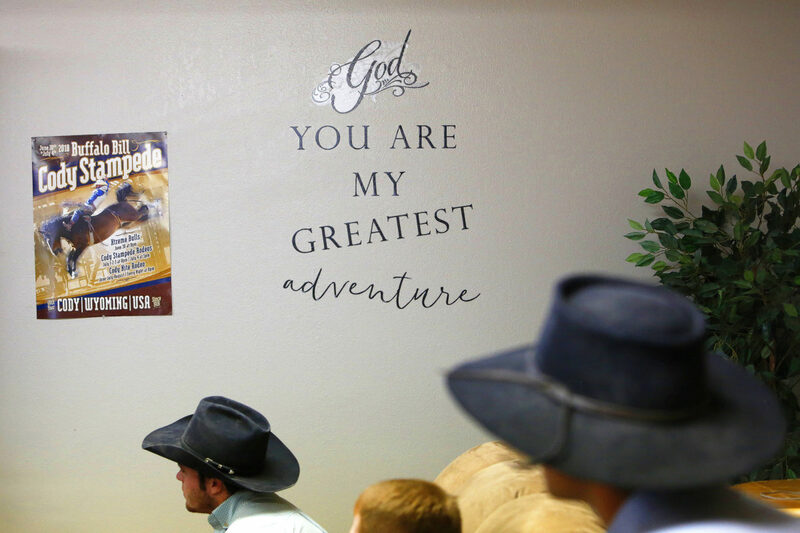 Bunkhouse resident cowboys watch film from the prior night's rodeo underneath a Cody Stampede poster and a decal that reads "God, you are my greatest adventure" in the Cody Cowboy Church bunkhouse den in Cody, Wyoming on Wednesday, July 11, 2018. Pastor Pat and Rene Alphin opened the bunkhouse in 2018, which offers free lodging for 10 cowboys at a time. The bunkhouse is not coed, but cowgirls are welcome to attend critique and instructional sessions during the day. 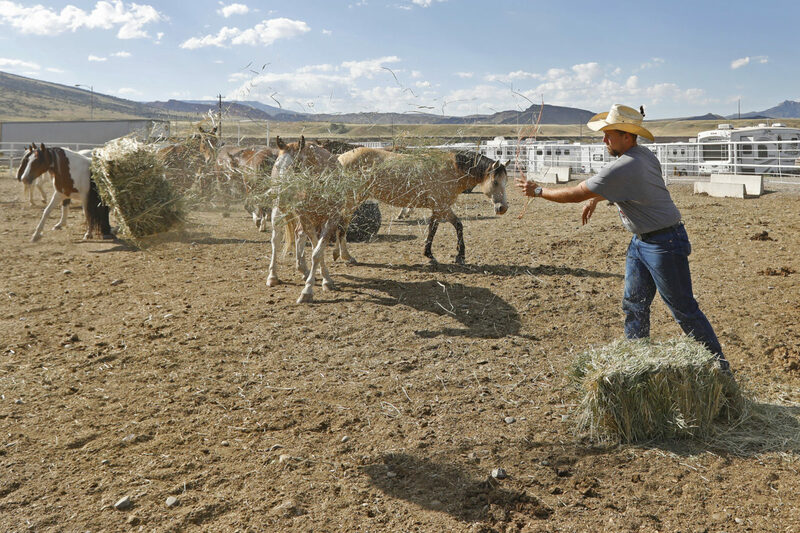 Cowboys flock to Cody for the summer from all over the U.S., some from foreign countries, and the free housing makes it possible for athletes to extend their stay in the rodeo capital of the world. Wyatt Lehman throws eager horses their dinner. 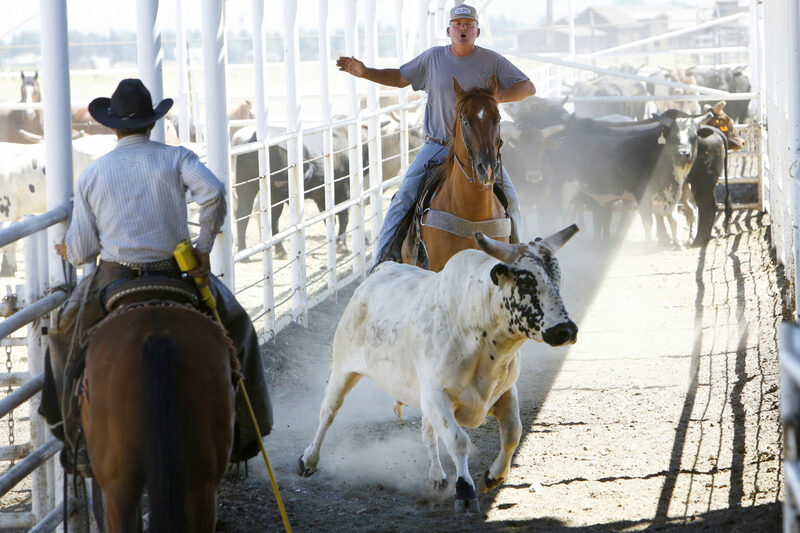 Daryl Lamb, center, drives a bull to a separate pen while Tom McFarland, left, assists. 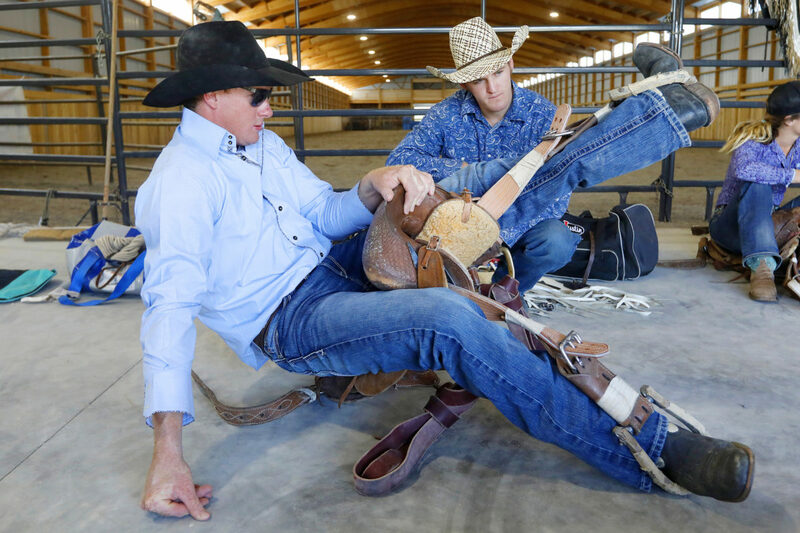 Thomas Burnett, left, stretches out in his saddle under the supervision of Dallas Hay, right, during an instructional session with professional rodeo coach Rick Smith at W Arena in Cody, Wyoming on Wednesday, July 11, 2018. Burnett and Hay were two of five Australians who made the 17 hour journey to Cody this summer. Cody Nite Rodeo is well-known throughout the rodeo community in Australia where a rough stock rider is lucky to get on a bronc or bull once a week. 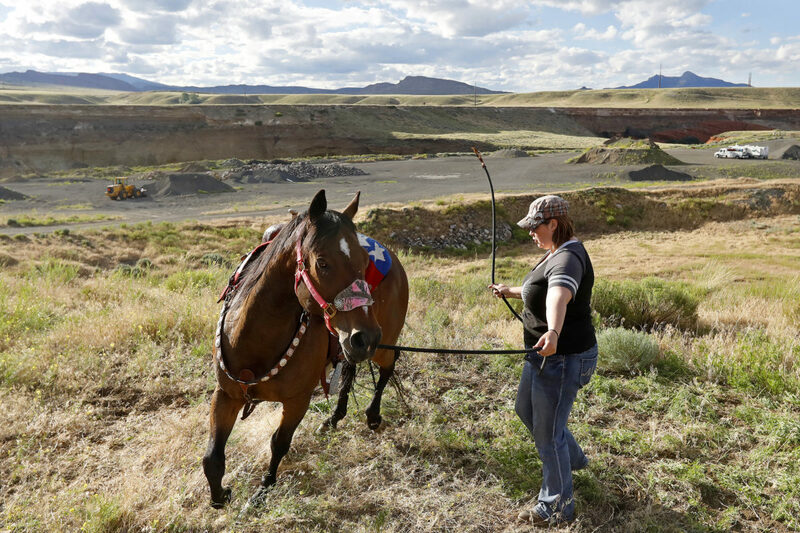 307 Renegade Riders Drill Team member Brittany Jackson of Powell, Wyoming warms up her horse before Xtreme Bulls at Stampede Park in Cody, Wyoming on Saturday, June 30, 2018. Cowboys and cowgirls hit the dirt at 8 p.m. sharp every night from June-August. The official performance ends at 10 p.m., but slack often keeps the grounds open later into the night. 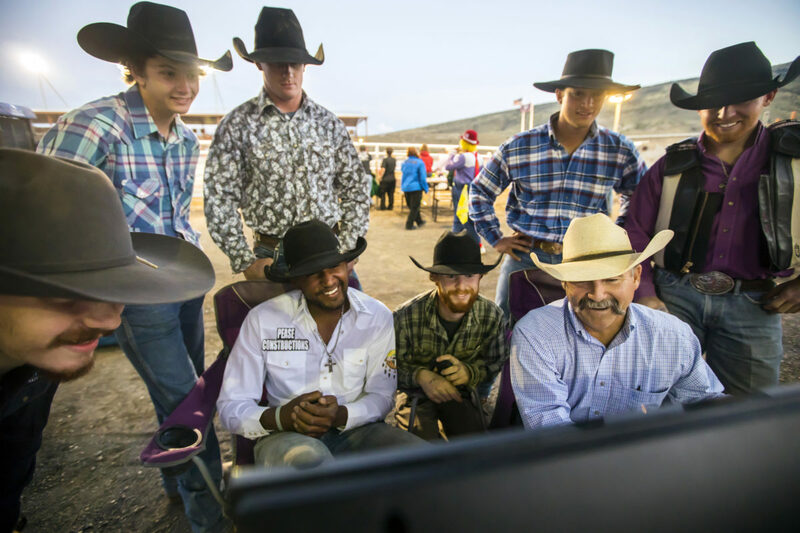 From left, Colby Daniel, Logan Nunn, Thomas Burnett, Josiah Running Crow, Will Downing, pastor Pat Alphin, Owen Witte and Kody Rinehart smile at a playback of a bronc ride at Stampede Park in Cody, Wyoming on Wednesday, July 11, 2018. In addition to the morning critique sessions at the bunkhouse, Alphin also reviews video footage with the athletes behind the bucking chutes as the rodeo continues on behind them. Colby Daniell competes in saddle bronc riding. 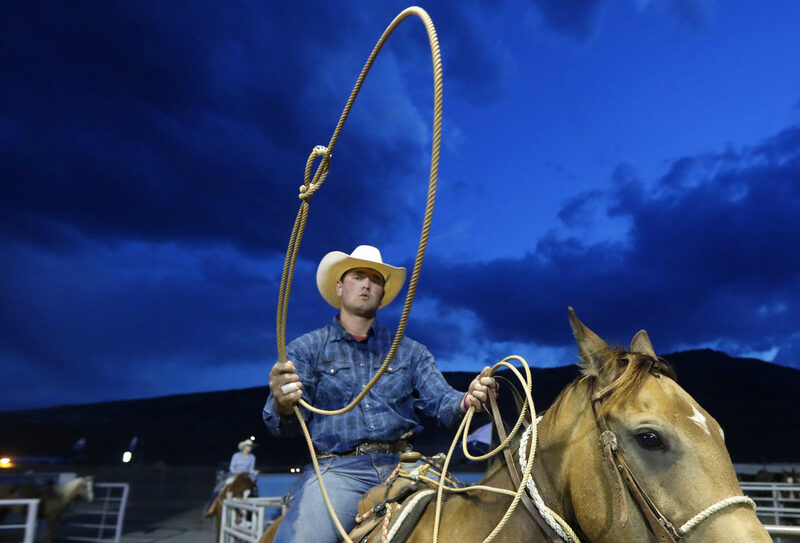 Seasoned saddle bronc rider Kody Rinehart, right, helps Owen Witte, left, with his rigging before the Cody Nite Rodeo at Stampede Park in Cody, Wyoming on Friday, Aug. 10, 2018. Witte, of Wessington Springs, S.D., decided in mid-July to give saddle bronc riding a shot out of the blue while working for a ranch in Cody. He began attending critique and instruction sessions daily. Witte rode broncs daily throughout several weeks at the rodeo. 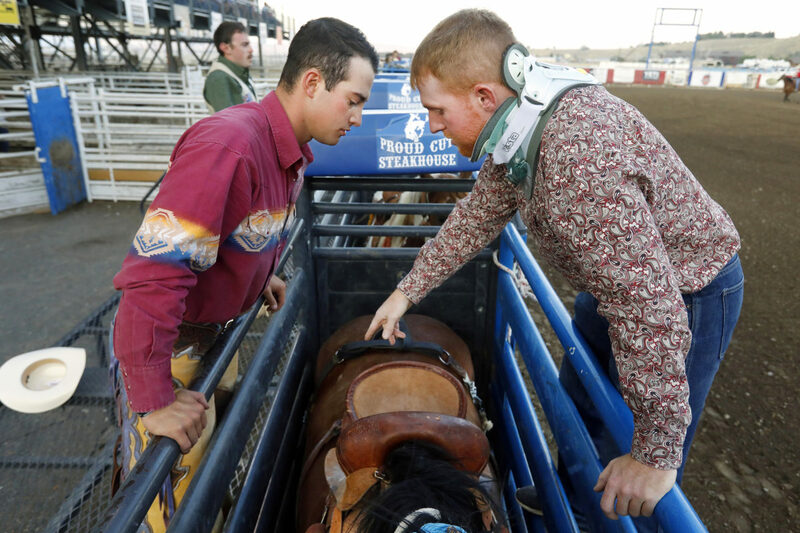 He was out for about 10 days with a concussion and never rode for the full eight seconds before the end of the season, but left town with a serious case of the rodeo bug, eager to try again soon. 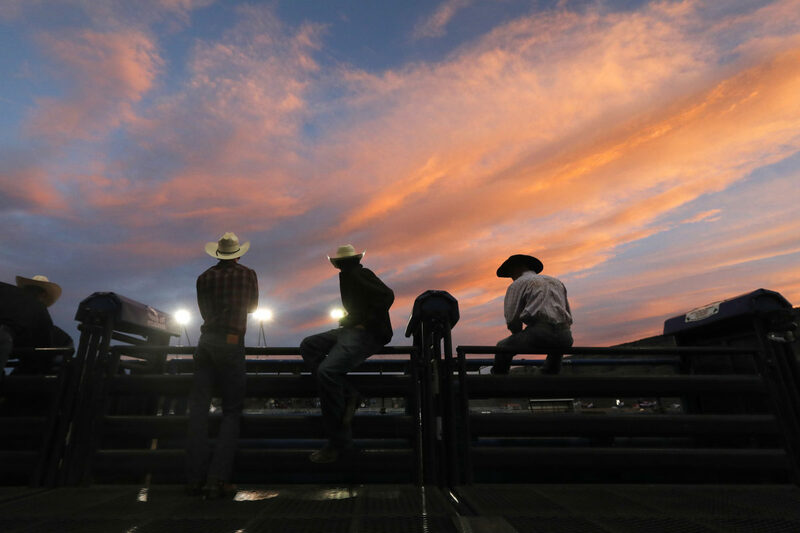 The crowd filters out of Stampede Park after the conclusion of the Cody Nite Rodeo Finals in Cody, Wyoming on Saturday, Sept. 1, 2018. "Cody is where the pavement ends and the West begins," said Sid McFarland, rodeo clown of 44 years and Cody Nite Rodeo regular. 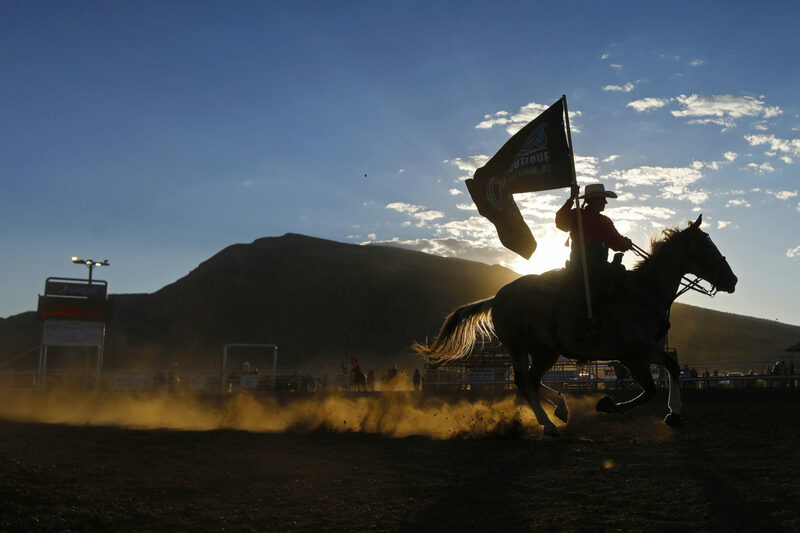 A member of the 307 Renegade Riders drill team flies a sponsor flag. 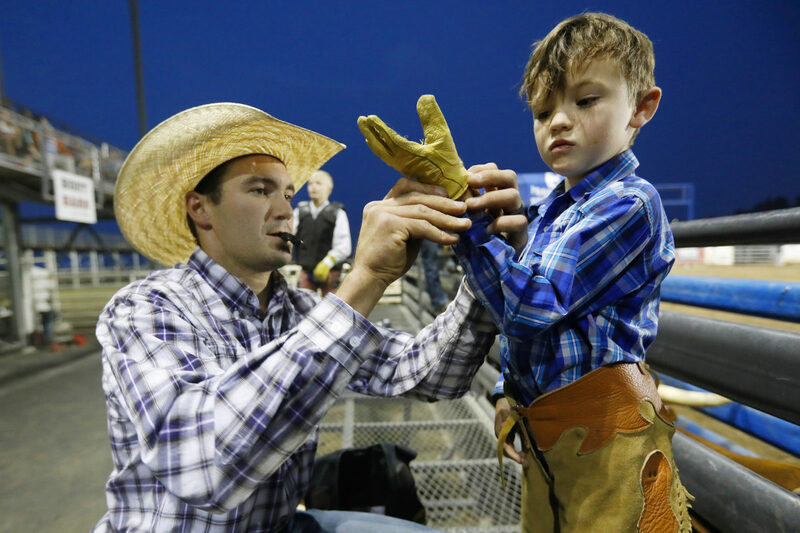 Matthew Skaw, left, helps his son Braxton Skaw, 6, right, of Laurel, Montana get ready to compete in junior steer riding during the Cody Nite Rodeo at Stampede Park in Cody, Wyoming on Thursday, Aug. 16, 2018. Skaw drove the 100 miles from Laurel to not only give saddle bronc riding a try on a whim, but to give his son a chance to ride junior steers. A cowgirl watches slack competitors. 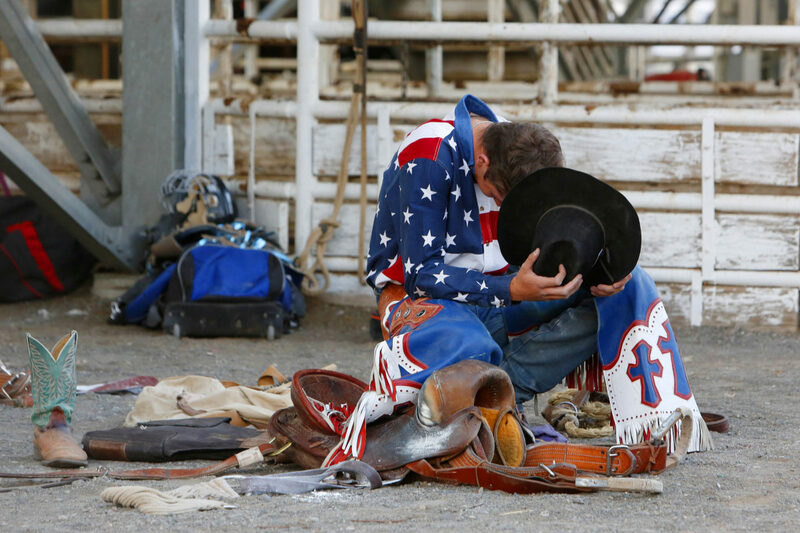 Logan Nunn prays behind the chutes before the Cody Nite Rodeo Finals at Stampede Park in Cody, Wyoming on Saturday, Sept. 1, 2018. 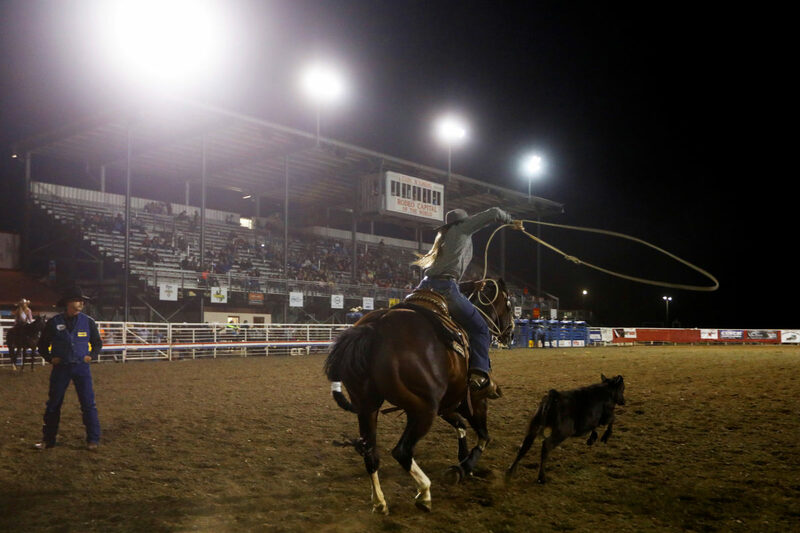 Participation in the Cody Nite Rodeo is a tradition passed down through generations in local families. Cowboys and cowgirls who grew up busting out of the chutes at Stampede Park now see their children and grandchildren following in their footsteps. The rodeo hosts kid's events during live performance such as junior barrel racing, junior steer riding and mini-bull riding. 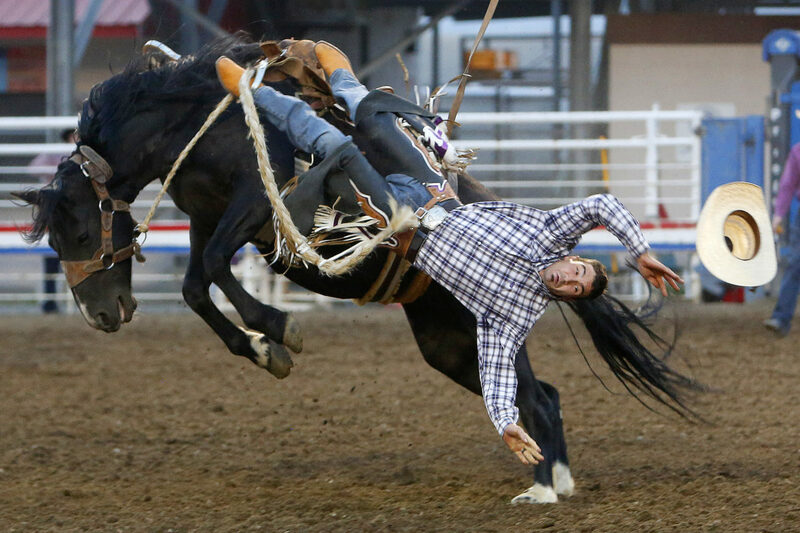 Matthew Skaw of Laurel, Montana falls from his bronc for no time during the Cody Nite Rodeo in Cody, Wyoming on Thursday, Aug. 16, 2018. Skaw, a bull rider, came to the Cody Nite Rodeo to try out saddle bronc riding and rode for eight seconds and a score of 72 on his fourth try. 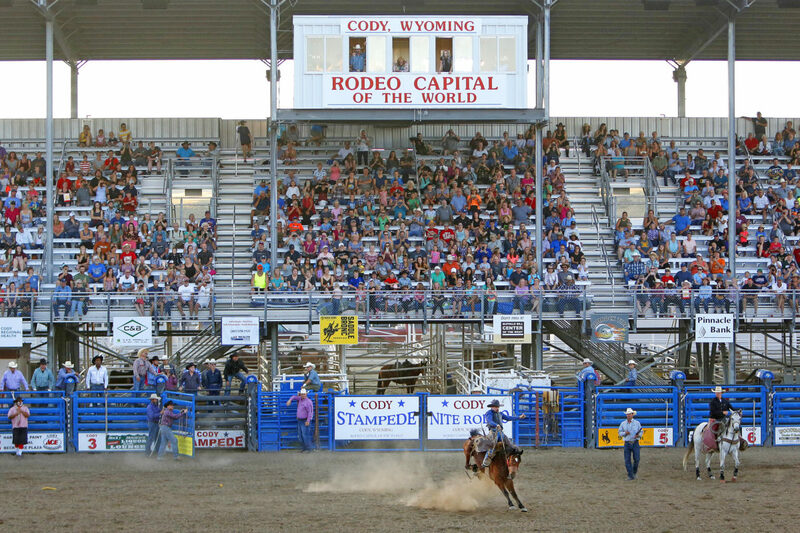 The “world famous” Cody Nite Rodeo in Cody, Wyoming, the “rodeo capital of the world,” saw its 80th year of rodeoing for 90 nights straight in 2018. The rodeo was founded by Carly Downing, a former trick rider in Buffalo Bill’s Wild West show, in 1938. 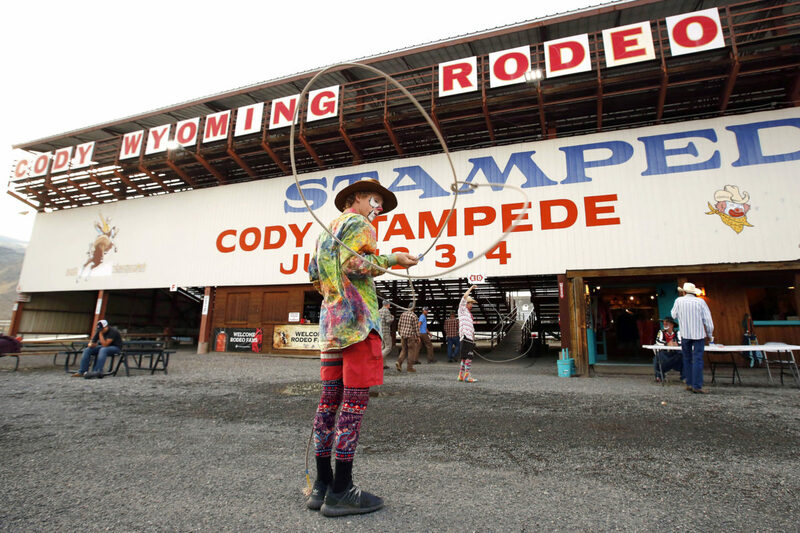 At first glance, the Cody Nite Rodeo is a tourist destination and a crucial source of economic stimulation in Cody. Stampede Park is a mere 50 miles down the road from the East Entrance to Yellowstone National Park. Many tourists coming or going from Yellowstone spend a night in the town built by Buffalo Bill Cody himself, buy a cowboy hat and attend their first rodeo. At its core, Cody Nite Rodeo is a vital training ground for budding cowboys and cowgirls to gain more experience in a summer than they could anywhere else in a year. The rodeo draws crew members and contestants from across the country and even as far as Australia. 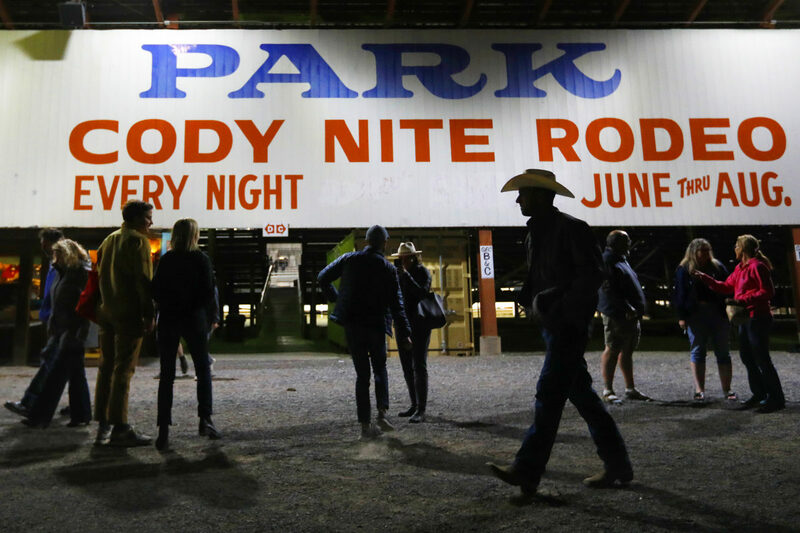 In 2018, two major resources joined the Cody Nite Rodeo community. The first was the opening of the Cody Cowboy Church’s bunkhouse, which provides free housing for up to 10 cowboys dedicated to bettering their rodeo skills. The second was a partnership Cody Nite Rodeo stock contractor Maury Tate struck up with the Professional Rodeo Cowboys Association to fund a rotating roster of professional rodeo coaches to teach the ins and outs of rough stock riding every day of the week. 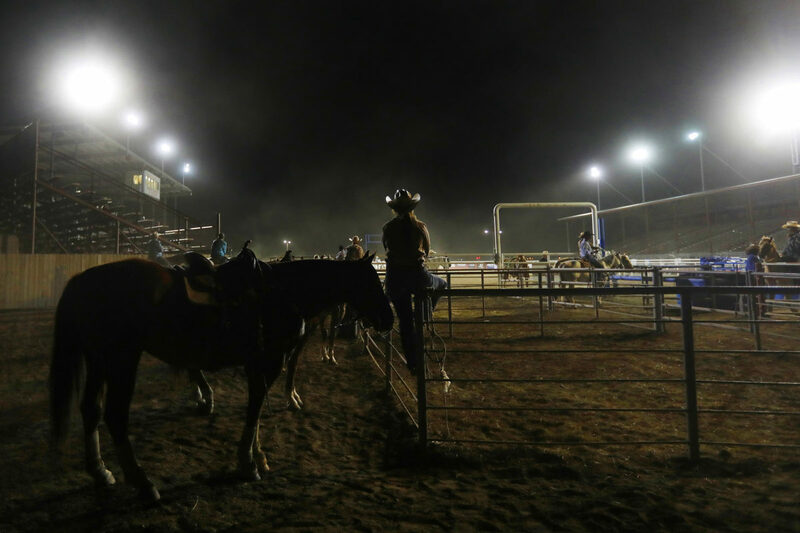 As numbers of young rodeo contestants dwindle, the future of rodeo relies on institutions like the Cody Nite Rodeo to provide aspiring cowboys and cowgirls with a wealth of experience and passion for the quintessential American sport.